The development of gyratory crusher has the history of hundreds of years. At present, it is mainly the important device for primary crushing of various kinds of hardness materials in large mining and other industrial department with the advantages of large throughput capacity, big feed granularity and crushing hardness ore. 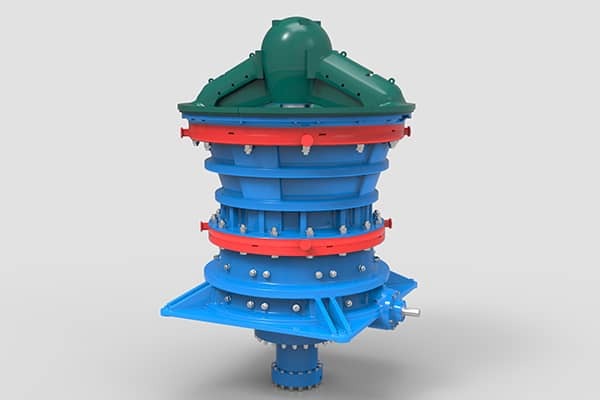 The gyratory crusher crushes the materials continuously along the circular crushing cavity, so it has large production capacity and low power consumption. With the stable working status, it is suitable for processing schistose materials. But compare with the jaw crusher, it has complex structure, high price, difficulty for maintenance, high repair cost and high capital expenditure. There are still quite differences in products quality and performance between domestic and overseas crushers, especially in the aspects such as overall design, manufacture and automation of key parts. In order to close the gap, our manufacturers adopt the existing technologies to improve the products performance and reliability and absorb the advanced overseas concepts and technologies to develop the crusher in large size and intelligent orientation. In this way, we will keep growing to close the gap, approaching or reaching international level.